I don't usually post fashion finds here but I think this recent purchase is worth a blog entry. Earlier this month, I bought 2 statement shirts from an online shop -- Blogger Shirts. The shop is owned and managed by Fitz, a very good friend with his creative partner. They sell shirts that are associated with blogging. Choose from a variety of shirt designs and colors that comes in limited editions. The shirts come in men's and ladies' sizes. 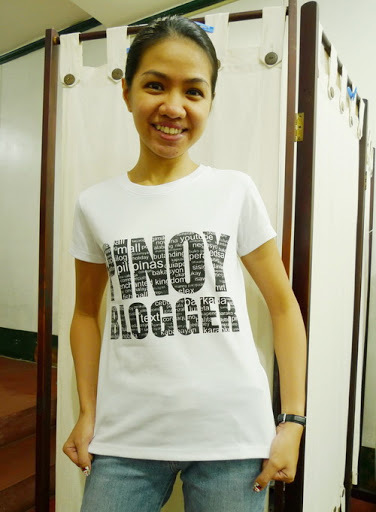 My favorite is the Pinoy Blogger shirt. This design comprises of several words and phrases related to being a Filipino blogger. I recommend this shirt to all Pinoy bloggers. Own one and wear it proud! This design comes in another edition with a sun and 3 stars to incorporate the Philippine flag. Perhaps one day they'll come up with a "Pinoy Nail Art Blogger". I would definitely buy ALL the colors! 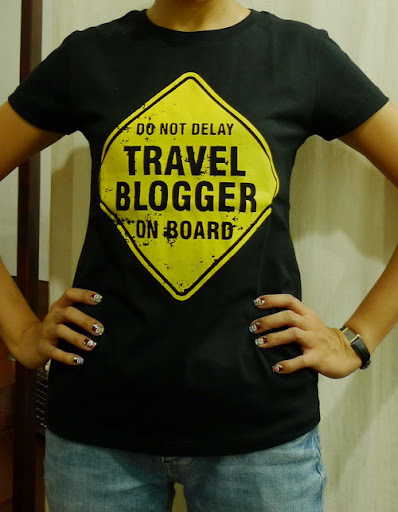 *wink* But for now, I did buy the Travel Blogger shirt as well. Would love to wear this on my next trip! Posing with my Travel Blogger shirt and Snowman Parade nail art. Please visit the Blogger Shirts Online Store and check out their awesome shirt designs. They ship nationwide and to some international destinations. Choose from flexible payment options and the they provide a size guide to help you before finalizing your order. Those t-shirts are so cool! Very creative!